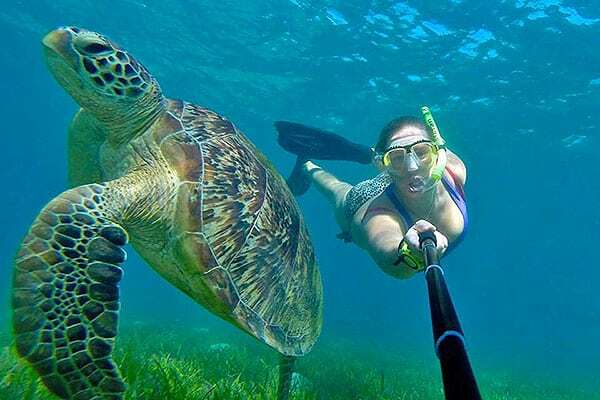 The most exclusive, personal, customer-oriented Great Barrier Reef tour in Cairns. Green Island is a truly tropical haven situated 26 km from Cairns on The Great Barrier Reef. Ocean Free sails you to Pinnacle Reef, an exclusive reef site located in the highly protected Marine Park zone just off Green Island offering excellent coral coverage and vibrant marine life. 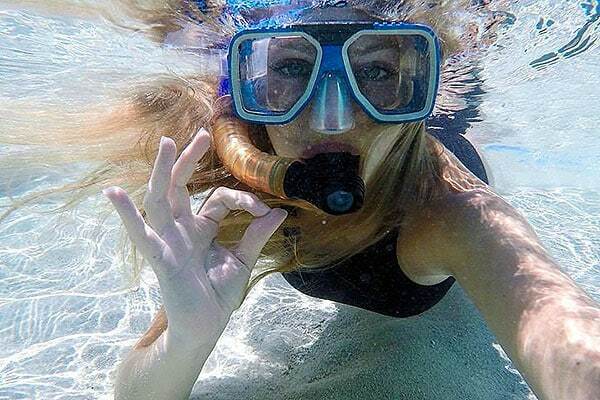 Its protected waters are the perfect location to discover the reef snorkelling or scuba diving. 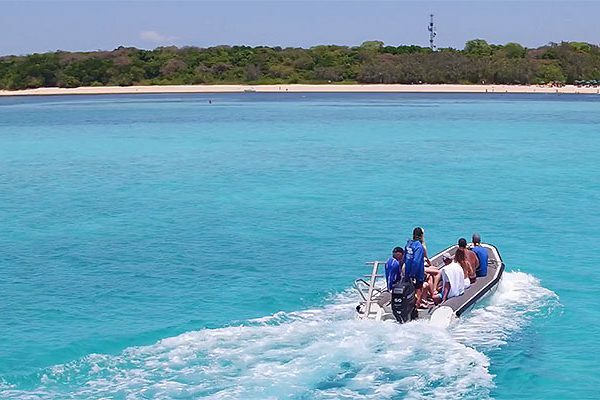 Experience the best of both worlds – the spectacular marine life on your private Great Barrier Reef site and then get taken straight to Green Island beach where you can explore the tropical island or just relax in the cool, crystal clear, shallow waters. A full copy of the Ocean Free daily itinerary can be downloaded here. 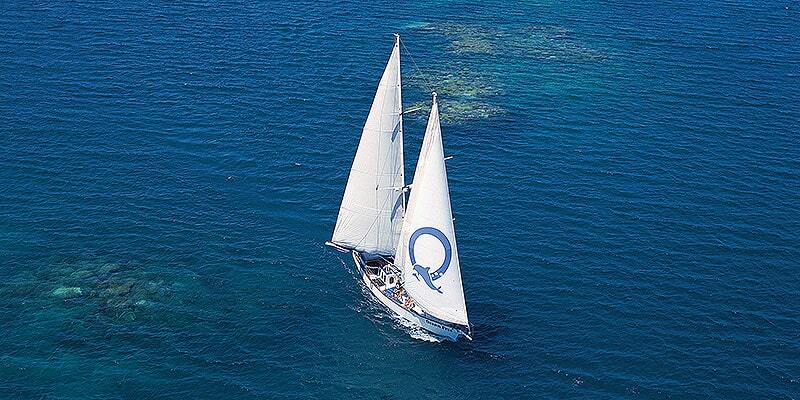 Ocean Free is a 16.5 metre sailing schooner. Check in at Reef Fleet Terminal from 7.15am at Ocean Free + Ocean Freedom desk. Board from 7.30am A Finger No. 4 at the Marlin Marina, Cairns for an 8am departure – coffee, tea and Danish pastries and fresh fruit served on boarding. Pinnacle Reef and Green Island, part of the Great Barrier Reef Marine Park. Pristine destinations which offer visitors a wealth of natural experiences. Pinnacle Reef is just 1km from Green Island. It’s shallow sheltered waters are the perfect place to snorkel and dive. Upon arrival at Pinnacle Reef, guests can enjoy a swim, snorkel, a dive (optional extra) or just relax. Ocean Free’s exclusive mooring ensures that the ocean is uninterrupted by crowds. The “bommies” (coral outcrops) and coral gardens, from just 1 metre under the surface, are teaming with life and make viewing easy. The trips to Green Island are by tender. 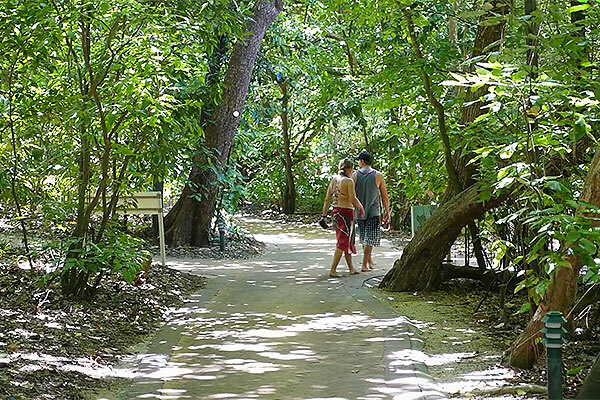 There are 4 ½ hrs for guests to spend between the reef and the island. 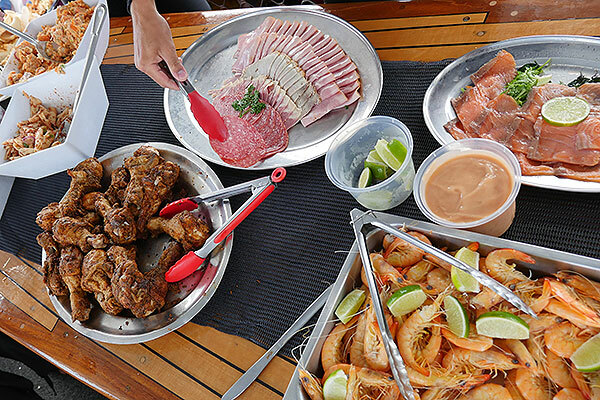 A large smorgasbord lunch consisting of Tasmanian smoked salmon, prawns, mixed meat platter, chicken platter, 3 fresh salads, assorted breads is served on board the boat. It’s a self-serve buffet. We can cater to dietary restrictions, just let us know at the time of booking as this must be pre-booked. Tropical fruit platter, cheese, crackers, cakes and a glass of wine are served on the sail home. Water is available throughout the day. Extremely low guest numbers (max 25 guests) with 4 crew ensures a personal snorkel and dive experience. 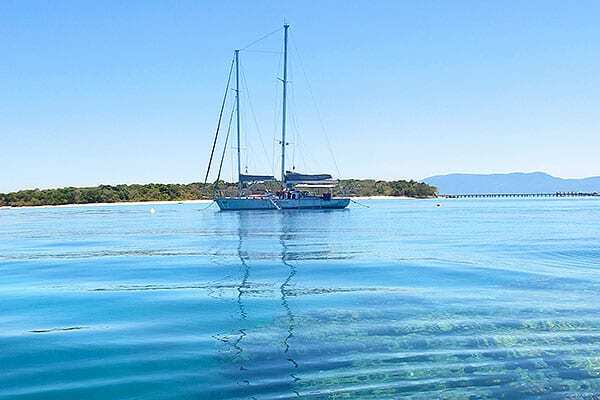 All guests are assessed for their snorkelling and diving abilities and are appropriately assisted to ensure that all are able to experience and enjoy the Great Barrier Reef. Guests need to be mobile enough to get into and out of a dinghy onto the beach and into and out of a dinghy from the main vessel. Guests who have never dived and wish to try it, may do an introductory dive. Maximum 2 divers to 1 instructor for your first dive (normal ratio on other tours is 4:1). 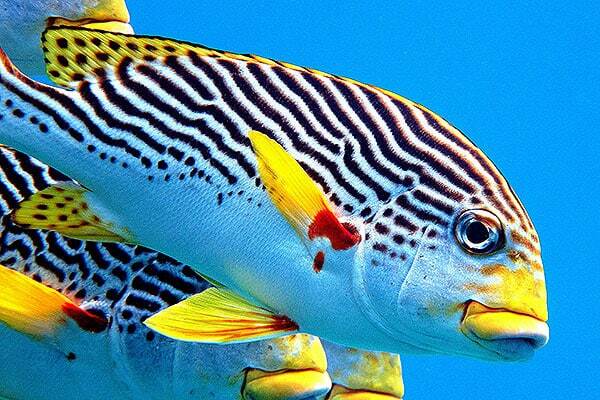 Guests who are certified divers can enjoy the wonders of the reef with a complimentary guide. 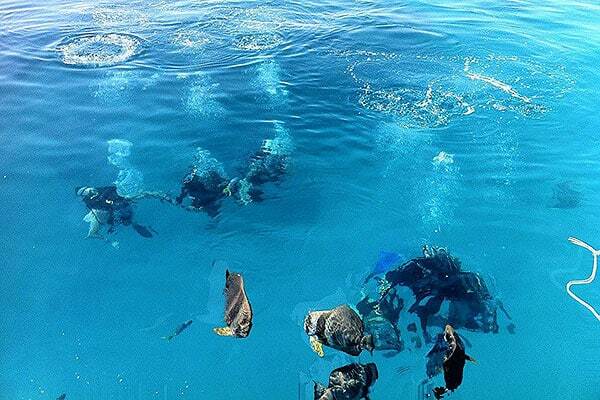 All diving is done directly from the Ocean Free boat on Pinnacle Reef, which is 1km offshore from Green Island. Shallow, sheltered waters with an abundance of marine life. A gentle diving experience. All snorkel and scuba diving equipment and tuition, including top quality snorkelling gear, buoyancy vests/wetsuits/lycra suits. High crew to guest ratio. Scuba diving demonstration. Coffee/tea + Danish pastries and fresh fruit on boarding. Complimentary coffee/ tea when moored. Fish Feed. Transfers to and from Green Island. True Sailing experience (engines do get switched off!) on way home. Complimentary glass of wine on sail home. Certified Diving, you can choose to do 1 or 2 cert dives. Introductory Diving, with no experience necessary. Book 1 or 2 intro dives. For the diving, all of the equipment, instruction and dive guides are included in the dive prices. Underwater camera hire. Glass Bottom Boat / Semi-sub (pay on Green Island) – just let skipper know on boarding boat in morning. Alcoholic and soft drinks refreshments. A range of quality merchandise. 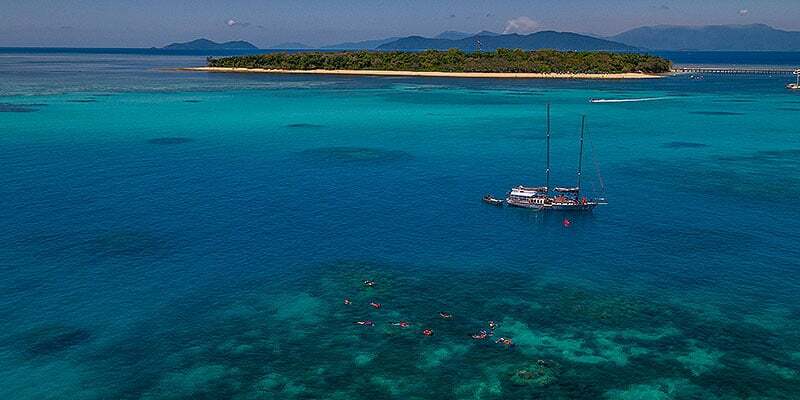 Ocean Free provides guests with 4 ½ hrs at Green Island and Pinnacle Reef, on the Great Barrier Reef. They can spend this time as they choose. All on the boat. All at the island. Or split your time between them both, for a fantastic day tour experience. There’s lots of activities for you to choose from: snorkelling, scuba diving, island walks, glass bottom boat tours, relaxing the beach, grabbing a cocktail from the island bar. $20 per person pay at check-in comprising of $6.50 EMC (environmental management charges) / Port $2.83 (levy & berthage) / RAM $2.70 (recreational area management fees) / Admin $7.97). Bus Transfers are an optional extra and must be pre-booked – the bus will pick from Cairns and as far north as Palm Cove. For more information on any of this, please contact Ocean Free on phone (07) 4052 1111.